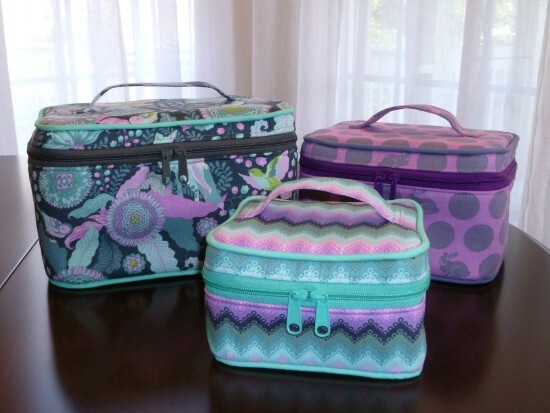 Thank you for joining us for our Crimson & Clover Train Cases Sew Along with the lovely Sara Lawson of Sew Sweetness! Today, we’re talking through attaching the lid and finishing the bag, guided by your host, Sara Lawson. Don’t forget to share your creations with us online on Facebook or Instagram (using the tag #sewalongwithsewnews) or email us directly. We can’t wait to see your train cases! My friend Terry made these beautiful Crimson and Clover Train Cases out of Tula Pink Foxfield fabric. Although there are photos in the sewing instructions on how to sew the lid and the bottom of the bag, this step is better visualized in person, so Terry shot this hyperlapse video of the final step in the pattern of pinning the lining to the bottom of the bag (the lid is finished in the same manner). Hope you enjoy! For more on constructing this bag, see week 1 for piping tips and week 2 for zipper installation.